I would like to invite all those in the Central Missouri area, and anyone else wanting to come for a visit, to join me July 7th and 8th in Springfield, MO at Drury University for two days of dog bite seminars. 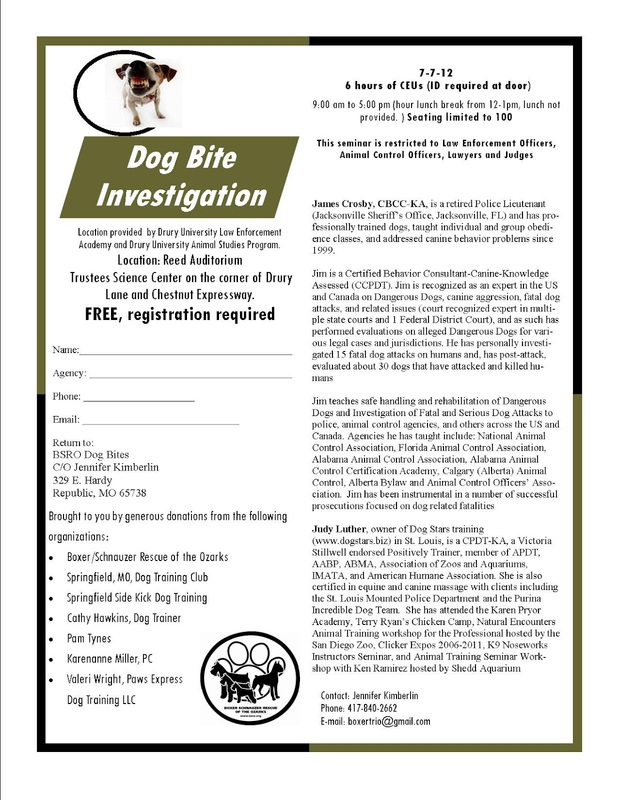 Saturday the 7th will be an all day course on investigating dog bite fatalities, and the audience will be limited to Law Enforcement, Animal Control, prosecutors, attorneys, and judges. Some active cases will be discussed, so ID will be required at the door. 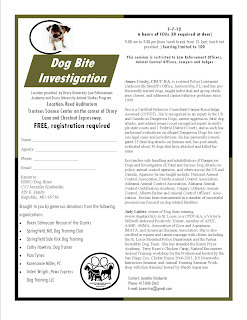 Sunday, July 8th, will be a public event addressing dog bite investigations and behavior behind dog bites for owners, trainers, and interested dog lovers. This will be a less technical presentation (less gore) and we will also discuss bite prevention and Breed Specific Legislation issues. Both event are free due to the generosity of Drury University's Law Enforcement Academy, the Drury University Animal Studies Program, and local business sponsors, all of whom I thank in advance. Thanks also to Jennifer Kimberlin, who has run with this furiously to put it together, and Judy Luther, who suggested coming to Missouri and started the ball rolling. AS I said, these events are free, but registration is required as we are limited to 100 seats each day. Attached below is the registration info-PLEASE JOIN US!